The reason this film, above most of the others in the Summer film series at Tampa Theatre, should be seen in a darkened movie house can be answered in one word-CinemaScope. The process of CinemaScope was unique to the fifties, and this film was a prime example of a process that made the colors and the visuals blend into the storyline and in doing so created one of the first science-fiction Cinematic Universes for audiences and lovers of the genre. The plot of Forbidden Planet involves a spacecraft traveling to the planet Altair IV to discover what happened to a group of scientists sent to explore the planet decades ago. Commander Adams (Leslie Nielsen-playing it straight!) & his crew find only two people living there; Dr Morbius, played by Walter Pidgeon, and his daughter Altaira, played by Anne Francis. Made in 1956, the movie is loosely based on Shakespeare’s The Tempest and was most notable for the introduction of Robby the Robot. Robby was more than just an inanimate object, and the film made it a cut above the usual hokey sci-fi stereotypes in that the character of Robby actually became an integral supporting role in the movie. Full of lush colors and classic fifties sci-fi visuals, Forbidden Planet was, as mentioned above, shot in the groundbreaking Cinema Scope process and was nominated for Best Visual Effects at the Academy Awards. The picture is a genuine science fiction classic, and to cement its importance in the genre, it was entered into the National Film Registry in 2013. There are only a few films in this series that are worth sitting in a dark theatre and viewing during the long hot summer months. This is one of them. 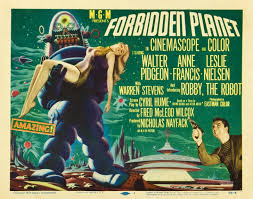 Forbidden Planet is playing at Tampa Theatre this Sunday at 3:00 pm. Previous Previous post: Summer Film Series at Tampa Theatre: The ones to see at the movies!